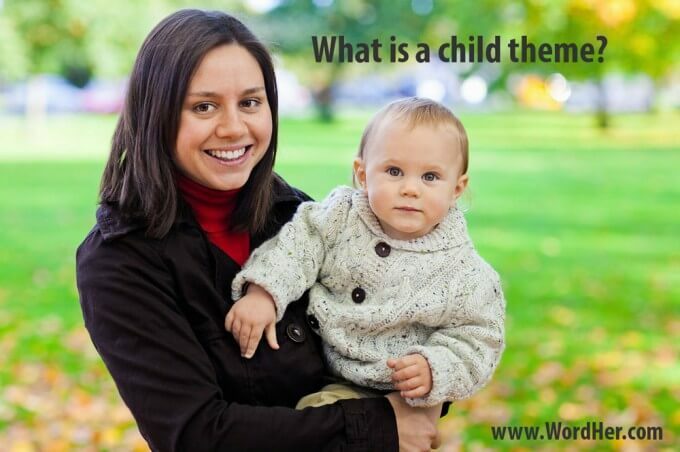 A child theme is a WordPress theme that inherits all of the functionality of its parent theme. The benefit of using a child theme is that you can modify it to your heart’s content, and when the parent theme is updated, you will not lose any of your custom modifications. It is the recommended way to make custom changes to a WordPress theme. By changes, I mean coding changes, not the kind of changes that are done OUTSIDE the theme by using widgets and plugins. Here is an example of how the hierarchy of parent and child theme inheritance works. Imagine you have a parent theme (called Grownup) and a child theme (called Toddler.) If Grownup declares the background color as tan, then if there is no declaration of background color in Toddler, then your background color will be tan. However, if Toddler declares the background color as yellow, your color will be yellow. When the Grownup 2.0 update is applied, and Grownup’s background color changes to pink, Toddler will not change it’s color: your background color will still be yellow. To use a child theme, you must install both the parent and the child themes, but only activate the child theme.